Deontay Wilder and Chris Arreola had different impressions of the scales on which they weighed in Friday. Wilder said the scale was inaccurate; Arreola said, right or wrong, it didn’t matter. Wilder has told media members that he has added weight, partly to add more power to an already devastating punch. The champion is 36-0-0 with 35 of those wins coming via knockouts. Deontay Wilder weighs in and sizes up opponent before fight from Alabama NewsCenter on Vimeo. The challenger (36-4-2) weighed in at 246.2 pounds. 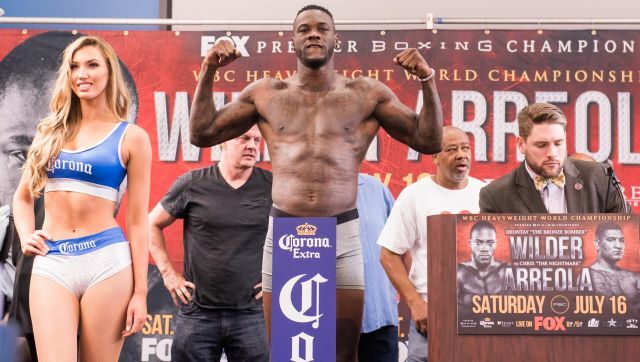 Wilder tipped the scales at 226.2, a full 20 pounds lighter. The champ dismissed the weight difference as a malfunction. He noted that the carpeted stage on which the weigh-in was conducted affected the readings. Arreola, who’s bidding to become the first Mexican or Mexican American fighter to earn the heavyweight championship, initially declined comment on Wilder’s claim. He did say that weight is not an issue in the heavyweight division. 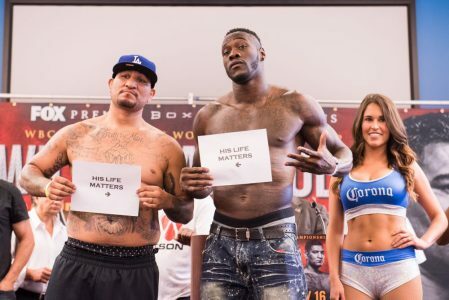 Following the weigh-in and obligatory stare-down, Wilder and Arreola posed together holding signs that read, “His life matters.” Each sign had an arrow pointing to the other boxer. The display was prompted by the challenger, apparently in response to racially charged violence the past few weeks involving police. 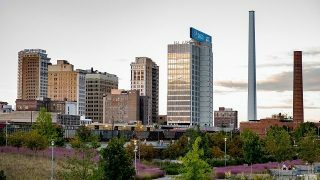 Doors of the Legacy Arena at the Birmingham-Jefferson Convention Complex open at 3 p.m. Saturday and the first fight on the card is set for 4 p.m. 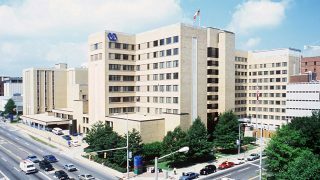 It was reported Thursday that there were fewer than 1,000 seats remaining in the $55 and $125 price level. There are more tickets available in the upper level, where seats are being sold for $20. The Fox broadcast airs at 7 p.m. and features the heavyweight title tilt, a Premier Boxing Champions event.